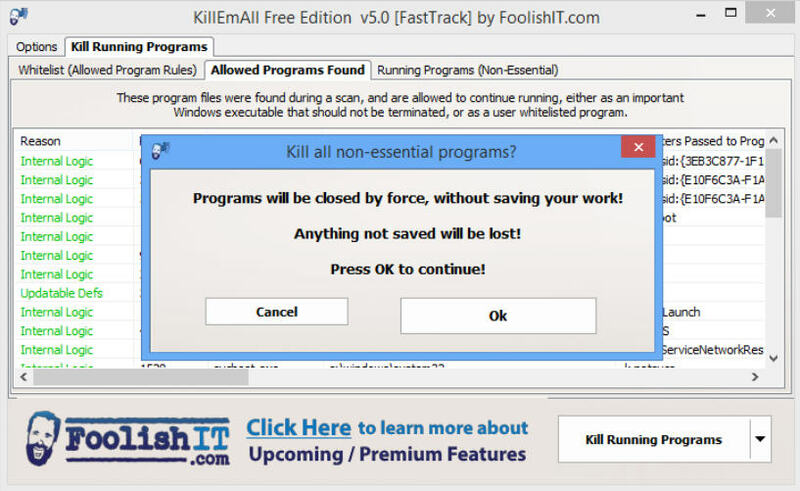 KillEmAll is a lightweight software solution that was designed to help users halt all the processes that are running on their computers in either visible or hidden modes, except those of them that are essential for Windows. KillEmAll provides you with a simple method of terminating various processes before it starts to dig into your computer. The application kills all foreign processes, thus eliminating the possibility to virus infections. The main window of the app consists of three tabs that you can easily switch between by simply clicking the ones you're interested in (the tab descriptions are pretty self-explanatory, so it shouldn't be hard to figure them out) and a large button that can be used to kill processes or create whitelist rules. You'll be warned before KillEmAll actually terminates the process, so that you don't accidentally press the button and kill all the processes without really wanting to. Additionally, you have a list of programs that will be spared when the purge begins, but you have to add them manually to the whitelist section. In order to do so, you just have to navigate to the appropriate section and use the large button mentioned above.